(Nanowerk News) A way to use weak molecular bonding interactions to create well-ordered and stable metal–organic monolayers with optoelectronic properties has been found by researchers from the RIKEN Surface and Interface Science Laboratory ("Supramolecular Assembly through Interactions between Molecular Dipoles and Alkali Metal Ions"). The development could form the basis for the scalable fabrication of molecular optoelectronic devices. A variety of emerging technologies are being investigated as potential replacements or enhancements of the electrical-charge-based electronics that lie at the heart of all electronic devices. Utilizing interactions between light and charge—referred to as optoelectronics—is of particular interest to researchers and engineers. Organic molecules that change state reversibly in response to pulses of light could, for example, be used to build versatile optoelectronic memory devices with ultrahigh storage capacities. 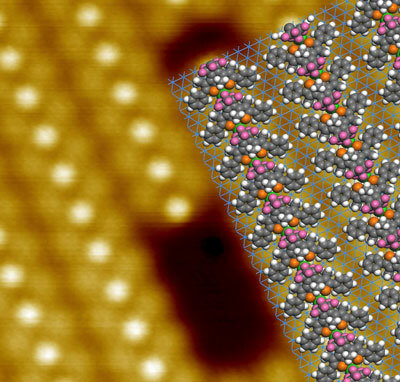 For individual organic molecules to be used as single digital ‘bits’ in such devices, the molecules need to be arranged into highly ordered, single-molecule layers, bonded to a metal surface. However, as bonding to a metal surface also affects optical properties, preparing ordered arrays of organic molecules with the desired optoelectronic characteristics has proved challenging. The RIKEN team, led by Tomoko Shimizu and Yousoo Kim, developed a scheme for laying ordered monolayers of diarylethene derivatives on a copper substrate. Diarylethenes have well-established photochromic properties, undergoing reversible color changes when irradiated with light. Crucially, the diarylethene derivative used by Shimizu and Kim’s team has an electric dipole, meaning that the distribution of electric charge in the molecule causes one end to be slightly negative and the other to be slightly positive. When the diarylethene derivatives are deposited onto a copper surface in the presence of sodium ions, the interaction between the ions and organic molecules results in self-organization of the molecules into a precisely ordered array in which the diarylethene derivative molecules are lined up in neat, tightly packed rows (Fig. 1). Application of a chemical ‘annealing’ process promotes a further subtle rearrangement of each molecule into a more stable configuration on the metal surface that reinforces the conductive ‘on’ state. The use of a copper substrate with a particular crystal arrangement, known as Cu(111), also facilitates precise arrangement of the organic molecules.